After many months of hard work it’s wonderful to have something to show you. 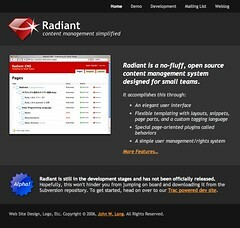 Today, I released Radiant into the wild with its own Web site. It’s actually been around since last week, but only a small group of people have known of its existence. Oh, and did I mention that the main site is actually powered by Radiant? I’ve taken a few screen shots of Radiant and the Web site and have posted them on Flickr.